1994-09-04. New. Ships with Tracking Number! INTERNATIONAL WORLDWIDE Shipping available. Buy with confidence, excellent customer service! 1988-09-07. New. Ships with Tracking Number! INTERNATIONAL WORLDWIDE Shipping available. Buy with confidence, excellent customer service! MapQuest.com. Hardcover. 0870447483 1988 tight over size hardcover and portfolio 17 piec maps magnifier acetate in slipcase centennial edition GIFT QUALITY will require extra postage . Very Good. 1988. Natl Geographic Society, 1994-10-01. Revised. Hardcover. Used:Good. 1994-09-04. Good. Ships with Tracking Number! INTERNATIONAL WORLDWIDE Shipping available. May not contain Access Codes or Supplements. May be ex-library. Shipping & Handling by region. Buy with confidence, excellent customer service! 1989-07-05. Good. Ships with Tracking Number! INTERNATIONAL WORLDWIDE Shipping available. May not contain Access Codes or Supplements. May be ex-library. Shipping & Handling by region. Buy with confidence, excellent customer service! National Geographic Society, 1993-06-01. Revised. Hardcover. Used:Good. Natl Geographic Society. Hardcover. 0870449702 New Condition. . New. Natl Geographic Society. Hardcover. 0870449702 Like New Condition. . Fine. Natl Geographic Society, 1988-12-01. First Edition. Hardcover. Used:Good. National Geographic Society. New. Brand New! Sealed/Never opened in cardboard mailer. No date stated. Natl Geographic Society. Collectible - Very Good. Washington, D.C.: National Geographic Society, 1988. Centennial edition. Folio. 289pp. B/W and color plates and maps. Near Fine book. Includes 1 transparent overlay with outline maps of the country at various scales, 1 magnifier, 10 fold-out maps and 'Spreading the Word About Geography by James B. Binko' book in folder. Book and folder in slipcase. Slipcase Near Very Good. Lightly bumped corners. Otherwise inside clean. Slipcase soiled. Inquire if you need further information. Washington: National Geographic Society 1993. Folio. (289 pp. col. ill., col. maps 47 cm . As New. Hardcover. 1993. 1988-09-07. Good. Ships with Tracking Number! INTERNATIONAL WORLDWIDE Shipping available. May not contain Access Codes or Supplements. May be ex-library. Shipping & Handling by region. Buy with confidence, excellent customer service! HISTORICAL ATLAS OF THE UNITED STATES. Pages 299 pp.Folio. Blue leatherette binding w/ gold stamping and cover illustration. Centennial Edition. Illustrated. Laid in are the folded wall map of the U. S. and the clear overlay showing borders and capitals. Very minor wear to the covers. A great reference work. Natl Geographic Society. Hardcover. 0870447475 New Condition. . New. National Geographic Society. Hardcover. 0870449710 New Condition. . New. Natl Geographic Society. Hardcover. 0870447475 Brand NEW Book ~ Tight & Bright ~ We Ship within 24 Hours + FREE Tracking, answer emails fast, accept returns & work hard to deliver 100% customer satisfaction! . New. Natl Geographic Society, 1988-12-01. Hardcover. Like New. Hardcover in slip case. Light wear to case extremities, as new besides. Fine binding and cover. Clean, unmarked pages. Ships daily. This is an oversized or heavy book, which requires additional postage for international delivery outside the US. MapQuest.com, 1989-07-01. De Luxe edition. Hardcover. Used:Good. Natl Geographic Society, 1994-10. Hardcover. Good. Natl Geographic Society, 10/1/1994. Hardcover. Like New. 289 pages : illustrations (some color), maps ; 48 cm + magnifying sheet (24 x 16 cm). Hardcover in slip case. Good binding and cover. Clean, unmarked pages. This is an oversized or heavy book, which requires additional postage for international delivery outside the US. Natl Geographic Society. Hardcover. 0870449702 Very Good Condition. Has some wear. Five star seller - Buy with confidence! . Very Good. Natl Geographic Society, 1994-10-01. Hardcover. Very Good. Hardcover. No slip case. Good binding and cover. Clean, unmarked pages. This is an oversized or heavy book, which requires additional postage for international delivery outside the US. Natl Geographic Society. Hardcover. 0870447475 Like New Condition. . Fine. National Geographic Society. Hardcover. 0870447483 Book is very clean. Crisp pages. Tight binding. Includes slip box. Includes supplementary content. Slight shelf wear on cover. Tanning throughout. Foxing. Good reading copy. . Very Good. Natl Geographic Society, 10/1/1994. Hardcover. Good. Very large folio. (289 p.) : col. ill., col. maps ; 47 cm. Hardcover. No slipcase. Text block starting to seperate from binding. Hinges weak. Ships daily. No international orders please. This book is extremely large. This is an oversized or heavy book, that requires additional postage for international delivery outside the US. Natl Geographic Society, 12/1/1988. Hardcover. Like New. Large folio. No slipcase. Blue cloth. Light foxing. Clean, unmarked pages. This is an oversized or heavy book that requires additional postage for international delivery outside of Canada and the US. Washington, D.C., U.S.A.: Natl Geographic Society, 1988. Minor edge and corner wear; no dj; corners are gently bumped and rubbed; lightly scuffed and scratched; some light shelf wear; ex-library with the usual library markings; overall a nice used CENTENNIAL EDITION! Blue cloth with gilt lettering on the front board and spine and a black and tan pastedown on the front board. Mapped endpapers. 288 historical and informative pages nicely enhanced by black and white and full-color photographs and illustrations! 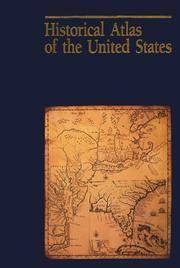 "Maps trace the development of the United States, showing environmental, political, social, and economic change........". Centennial Edition . Blue Cloth. Good/No Jacket. Atlas Folio - over 23" - 25" tall. Ex-Library. Natl Geographic Society. Used - Good. Good condition. Centennial Edition. Includes large color fold-out map and clear plastic overlay. NOT AVAILABLE FOR SHIPMENT OUTSIDE OF THE UNITED STATES. National Geographic Society. Hardcover. 0870449710 Very Good Condition. Five star seller - Buy with confidence! . Very Good. Natl Geographic Society, 1988-12. Hardcover. Good. Natl Geographic Society. Used - Very Good. Ships from Reno, NV. Former Library book. Great condition for a used book! Minimal wear. 100% Money Back Guarantee. Shipped to over one million happy customers. Your purchase benefits world literacy! Natl Geographic Society. Used - Good. Shows some signs of wear, and may have some markings on the inside. Natl Geographic Society. Hardcover. 0870447475 Ex-library book with usual markings. Good Condition. Five star seller - Buy with confidence! . Good.